When I posted my thoughts about the Extreme Couponing tv show last week, I promised to share my non-couponing ideas with you this week. Before I do that, I want to point out that I am not entirely anti-coupon. I use some coupons myself, and I think they can be a helpful tool. What I am opposed to is subsisting solely on groceries that can be purchased with coupons* (think the $4/week grocery shopper). I’m not convinced that doing so is responsible on a dietary level (it’s very difficult to eat lots of raw produce and fresh meat when you only buy coupon items) or on an earth-friendly level (it’s very difficult to buy unpackaged groceries with a coupon). *if the choice is 100%-couponed-food or starving, obviously I’d choose the couponed food. But for most of us, this is the not the choice we face. 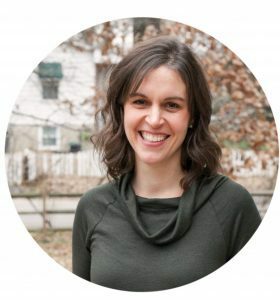 Anyhoo…I feed my family of 6 on a $100/week budget (that includes cleaning supplies, toiletries, and paper products) without depending on coupons much at all, so take heart! 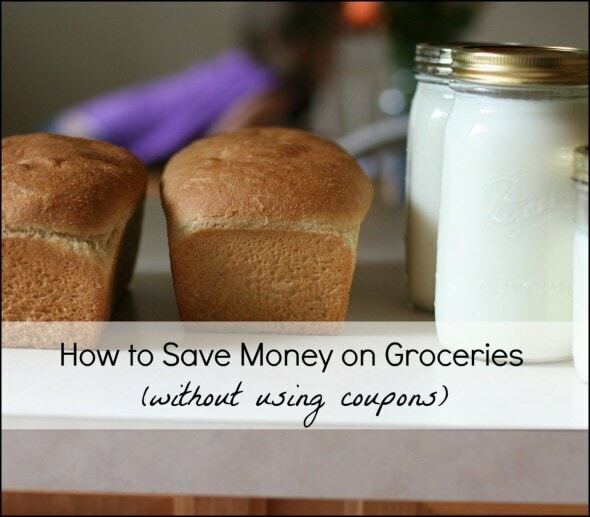 You don’t have to become a coupon queen in order to get your grocery budget under control. I want to talk about non-food grocery shopping in another post, so for today, we’re just going to focus on edible groceries. Here are the six main strategies I use to keep our grocery budget down. If you’ve hung around here long, you know I’m a big fan of generic groceries, and I think you should be too. Private label products have come a long way, and I’ve been more than satisfied with almost all of my purchases. Private label products don’t require a huge marketing budget, which means that you’re paying mostly for the food itself, not for the fancy ad. Plus, almost every private label produce I’ve ever purchased has come with a money-back guarantee. Some even come with a double money-back guarantee, so buying these products is pretty much risk-free. So, give them a try! Even if you find a dud every now and then, odds are good that you’ll find some keepers, and that can help to keep your grocery budget down. (if you have an Aldi, I’d especially encourage you to give their private label products a try. Aldi’s private label groceries are among the best I’ve ever bought). There’s little nutritional benefit to drinking sweetened beverages (even fruit juice isn’t particularly nourishing), so kick them to the curb, or at least reduce the amount you drink. I’d say the same goes for diet beverages…they provide nothing in the way of nutrition and are no more hydrating than water. They’re grocery budget fluff, and if you need to get serious about reducing your budget, this is a great place to start.
. That made a huge difference for us when we lived in an apartment with odd-tasting water. Little is said about this on money-saving blogs, which is kind of sad. There’s so much advice out there about how to obtain groceries cheaply, but little about how to actually use up all the cheaply-obtained groceries. If we stopped throwing away food, though, we could save a pile of grocery money (not to mention that we’d reduce our trash output). Read 10 Ways To Reduce Food Waste and join us for Food Waste Fridays. 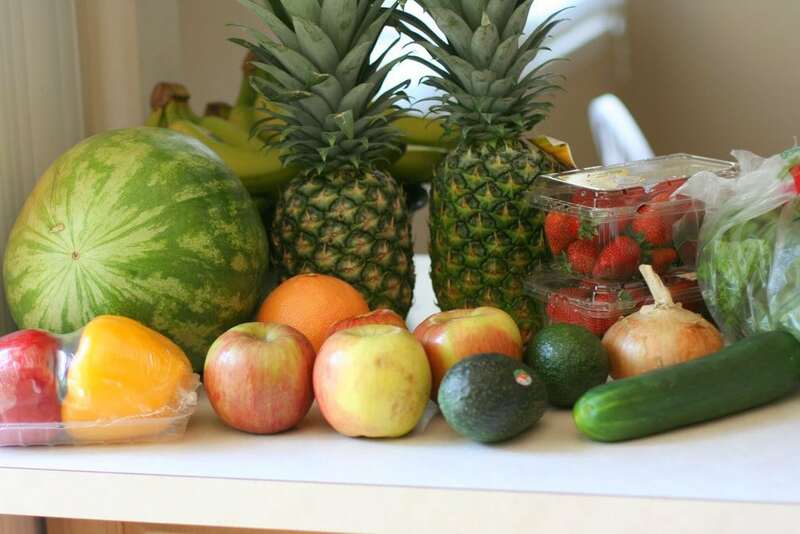 I think you’ll be amazed at how much money you can save by simply using up the food you buy. This is also not a highly publicized money saving idea (probably because it’s not a super fun one!). Of course, I would never encourage anyone to under-nourish themselves or their children, but in at least some households in America, people are eating more food than is necessary. If this is the case in your home, consider reducing portion sizes, and eat only until you are full. Looking for ways to save money on the food you currently buy will only get you so far. If you can move beyond that and start thinking of ways to swap cheaper foods for more expensive foods, you can start to make some real progress. For instance, looking for sales on cereal will save you some money, but if you start making pancakes or eating oatmeal from a large canister, your breakfast budget will drop significantly. In the same way, using coupons on lunch meat will save you a few dollars, but if you start eating leftovers for lunch (that’ll help you reduce food waste too! ), or start eating chicken salad sandwiches, you should see some budget savings. When you buy foods that are ready to eat or almost ready to eat, you’re going to be paying for the prep work that went into the food. So, try to cook and prepare food yourself instead of paying a factory to do it for you. This will be cheaper and likely healthier as well. If you’re just getting acquainted with your kitchen, take it slow. The more you cook, the better (and faster!) you’ll get at it, so hang in there. Try some of the main dish recipes I’ve posted, and keep your meals simple. If you make this task manageable, you’ll be more likely to stick with it. And whatever you do, don’t be scared of your kitchen and don’t think that only specially gifted chefs can cook. As my mom likes to say, if you can read, you can cook. Get a good recipe, follow the directions carefully, and you should be able to turn out a respectable meal. Readers, what non-couponing grocery saving strategies do you employ? Share in the comments! « I have too much to do today. This is especially timely with summer coming up! I find my kids could potentially eat me out of house and home when they are out of school. I purposefully limit them on some foods – thinking of your “eat less” idea – just because they would potentially drink a whole carton of orange juice, for example, because it is there and they are thirsty. Also summer is a great time for the kids to learn some cooking skills. Home prepared foods are cheaper and a great way for kids to learn in the kitchen. Drinking water is great! You can really spend a ton of money on packaged drinks. In the summer, I fill up one of the those large drink jugs with a spigot on the bottom with water and lots of ice and leave it on my counter so my kids can help themselves all day long. They love serving themselves from the water jug. Making iced tea is also very frugal. I buy a box of Lipton decaf tea bags for approx. $5, sometimes less on sale or with coupon. The box is 72 tea bags. I use 5 bags per pitcher of iced tea, so that’s quite a lot of tea…14 pitchers worth! For a treat, we have lemonade from the frozen concentrate. I find you can add a lot more water than the directions say and it still tastes good. I usually dilute with at least 6 cans of water. Just keep tasting as you go. I try to eat as much as possible in the season that seems to help my grocery bill a fair amount. Your Frugal Friday seems to have helped the most though. great post! We’re a family of five on a $100 week grocery budget, and we shop/eat similarly to you. One thing I’m starting to do right now, with the beginning of growing season, is to buy produce that’s in season. It’s cheaper to do this, and it’s also a fresher choice. Asparagus is in season right now, in my area, and is $1.49lb for locally grown. I’ve been buying a lot of it lately. When its season is done I’ll stop buying it, and move onto what’s next. I was a coupon gal. Everyone was so use to seeing my Facebook page with more photos of my purchases than my children. I had one that had nothing but processed cereals and frosting (but I paid “nothing” for it!) I say I paid nothing but in truth I paid in gas to the store, sanity with 2 boys under 2 and being pregnant, and I also paid in storage space. Not to mention the lovely example I was setting – if it is free what does it matter if it damages your health. That was me about a year ago. Then baby 3 was born and I had 3 under 3 to take with me. It was just not going to work with carrying coupons, making sure I was getting the right item and taking them in and out of the car at all the stores I had to go to for the “deal”. I found a blog about freezer cooking. What? Make it yourself? I was always told I was a horrible cook. Well I started small, recipes I could make and people would eat. Then a few months later I checked out a freezer cooking book from the library. The recipes all turned out (husband was so impressed he would take samples for his co-workers). Then I went online to cooking sites and typed OAMC and found more to try. In the summer I attempted to make some jam – my boys LIVE on PB and J at lunch. It wasn’t that hard. So I started researching canning. Wouldn’t you know it, I can do that too! Now when I go to the store I am so happy to see a yellow sticker with “manager’s special’ on it. I have picked up loafs of bakery bread for .25 and made some french bread pizzas. I picked up produce that is at it’s prime and won’t last much longer and whip up some jam, sauce or even dehydrate it for snacks later. Meat is also so much cheaper this way. I don’t always know what I am going to be making the next few days but I know it will be made and then eaten a few weeks (sometimes months) later. I feed a family of 5 (granted that 5 is 2 adults, a 3 yr old, 1 yr old and 4 month old) and send samples to work with my husband for $200 a month. I spend about 10 hours one weekend cooking but that is usually all the cooking I will do for the month!!! Just to give you some perspective – when couponing I would spend 10 hours a week shopping and clipping AND still have to cook at least 30 min a day. I would spend about $400 a month on my “savings”. I wish I could do this SO MUCH. please tell me: how much freezer space do you need to have to make this work? we only have 2 people, but we also are in an apartment and currently only have the freezer space above our fridge. I have investigated small chest freezers that I could make work space-wise in my apartment, but I’m hesitant to invest in one if it’s not sufficient. You can do it as big or as small as you like. I have two freezers (one above my fridge and a 15 cubic foot one) but you can use just your fridge one. I always suggest starting small because you don’t want to get a ton of equipment (or appliances) if it won’t work for your family. You can start out in so many ways. Some people double a recipe, freeze half and at half that night. That way you only have to cook 1/2 the month (and enter a store 1/2 as much cutting down on impulse buys). You can pick a main ingredient (like chicken) and work off from that making 4 or 5 different recipes. How I started was cooking a few things we liked for dinner that night and froze a small portion. Then for lunch we would eat the frozen meal (always have sandwiches as a back up in case it didn’t turn out). We would record our thoughts (and if the kids ate it) how to reheat it and if it was easy to take to work. After a few months we had quite a few recipes to choose from. It is a slow process (or at least should be done that way to prevent food/money waste) but after 6 months you should cut your food bill and be eating many homemade a delish meals. Let me know if you have any more questions – I LOVE this style of cooking and think many others will too once they get the hang of it. Your story sounds similar to mine. I find the more homemade, the more healthy and less expensive. I was really intimidated at first. I didn’t grow up with a Mom that made dinners, etc. but I soon found that I enjoy cooking and being creative. Now I make my own cleaning products (way, way cheap and better for the environment), breads, yogurt, etc. I cut down on waste and clutter and what I make tastes good! Thanks for sharing this! I really need to give freezer cooking a try! I have done this also and it worked great! Until my husband turned off the freezer thinking it was just the dial for the fridge and it all spoiled. This reminds me that I need to do this again. OH NO!!! I started to worry about power outages a few times this spring (with the high winds and we always lose power) but as long as you keep your fridge and freezer closed you can rest safely knowing your food is ok for at least 24 hours. Since I make everything from breakfast to desserts I am always in there and would notice if something went wrong. Lovely comment and great ideas. We had a freezer mishap last spring when the old one unexpectedly went to the great beyond. Sounds like you are doing a wonderful job for your family! Do you mind sharing the freezer meal blog you mentioned? sure – I am not sure if she is 100% freezer cooking anymore (I don’t go to her site much because of time constraints) it is lifeasamom.com I then went to food.com from there and typed in OAMC in the search tab. You can also check out your local library for freezer cooking (I liked the idiots guide one). Our library – and everyone I have ever had a card to check out books – will order it if they don’t have it. I will find a book at a book store that I think I will like and check it out first to see if it is worth my time and money (most aren’t). All these places are great starts to get you on the path for this kind of cooking. If you see a recipe from Frugal Girl you want to try – freeze some of it and see if you can add that to your list. One thing I learned from the OAMC cookbook is, if space is a constraint, freeze your food flat in ziplock bags. It takes up way less space since you can stack your food like books. Also, it’s way faster to thaw when in a thin “board” rather than a thick block. I think you pretty much covered it. The one thing that I don’t do that you didn’t mention is gardening. I think that if you are so inclinded you could grow a lot of fruits and vegetables, even canning or freezing them for consumption off-season. Or you could buy produce when it’s in season and do the same. Hi! Especially fitting for your post today is this article on today.com. It discusses how to prevent food waste. Enjoy! Yes, yes, yes! Perfect post, I could not agree more. We also feed a family of 5 on $100 per week (although that doesn’t include toiletries and the like). In our house we focus on meal planning and shopping current week sales to keep our budget under wraps. I try to keep food waste to a minimum but I admit I’m not the best about it. But I bet we throw away a lot less than other families. I may have to join Food Waste Fridays with you. We never drink juice and I recently kicked my soda habit too. Our kids have never drank juice (they don’t need it, I don’t know why parents still give juice to their kids) and we drink tap water. We finally cleared out room in our basement to try to fit a deep freezer and my intention is not only to stock up on items when they’re super-cheap (meat and produce I can freeze) but to look into buying a partial cow (grass-fed, organic). I get a lot of my money-saving ideas and tips from you Kristen, thanks so much for sharing with us everyday! Awesome post! When I decided to stay home with my children(now 16years ago) my food budget was the number one place I could cut back on spending. Encouraging my kids to drink water instead of juice/pop was a big savings, monetarily and for their health. The time that I don’t spend on couponing is a huge money saver! I have the time to be creative in other ways to save that money. $0.30 for one egg! Are you buying special “organic” super eggs or are they just super expensive by you? This week in the Capital region of NY eggs are on sale for $0.98 a dozen. Well if you can taste the difference; I’m not knocking you. I, can’t tell the difference. we can tell the difference in taste-I guess I would say it has a richer flavor? The coloring is different too. I always scoffed at the idea of paying so much for eggs (I’m in Portland and cage-free pastured eggs are $6/dz from the farmer’s market for large eggs), but I decided to do a taste test so I can prove to myself that there really was no difference…except I found that there was. The color is more orange, but more importantly, the flavor is noticeably superior. So now, for things like baking I use normal supermarket eggs and for eating plain I use the pricey ones. I’m a huge fan of soft-boiled eggs so that’s how I typically eat them. My friend’s mother always claimed that “farm” eggs were better overall than grocery store eggs. She made two identical cakes, one with farm eggs and the other with store eggs. The cake made with farm eggs was considerably higher than the other. I don’t know if the taste was any different, but I get organic eggs and I think they taste better. Michael Pollan has a great chapter on this topic in his book The Omnivore’s Dilemma. The free-range/humanely raised/non-corn-fed eggs have more kerotene and protein than regular eggs. He also wrote that in studies scientists have found that they have a lower amount of saturated fat–the eggs are actually healthier. The yolks are so much more firm because of the increased protein, and so they cook a lot better. You can really tell the difference in sunny-side-up recipes and souffle! My local farmer charges 25 cents per egg…which is no more than the grocery charges for organic eggs. When I think about how hens are treated in commercial production (even organic, even those that say “free range” and probably even the humane certified cartons) I just can’t bring myself to buy eggs anywhere else. It’s also nearly free (if they live on scraps and roam the yard – and you wouldn’t believe how much it cuts down on bugs!) to raise a few egg laying hens, IF your zoning allows it. This is an area where I’d rather vote with my dollars even it costs a little more. I save money by knowing prices on the things we buy frequently, and just being aware of how much various things cost OR who consistently has better prices on various types of items. Although I mostly shop the farmer’s market when it is open, I do know which store has the best prices and selection on organic produce on any given day. Also, I know that for items we use infrequently, Trader Joe’s is a good bet because they often have small packages and/or low prices. Example: tonight, we are going to have beef and yogurt sauce in pita pockets (sauce made of mint, cukes, and yogurt from the farmer’s market!). TJ’s had a pack of 6 pitas for $1.49. Similar product, store brand, was $2.19 at another supermarket. However, that supermarket does hands-down have the best prices on soda (I know, I know), the shampoo I use, and store-brand vitamins on any given day. I’m afraid most of my grocery saving practices come from actually just staying out of the grocery store. I grow most of my food and try really hard to make the rest. I know this is not an option for most people, unfortunately, but I think growing even a few things in pots is worthwhile. Also, I have had to overcome my aversion to baking so I can make my son things like cheddar crackers, which are really expensive to buy and not very healthy with all the junk companies add to what should be a simple recipe. Preaching to the choir here, I’m sure, about baking to save money, but if anyone else is thinking baking is just too hard/finicky/annoying and not worth the time, I offer myself up as an example of a non-baker who has nonetheless managed it. I do most of those things, but there are 2 up there I could do well to follow, eat less and eliminate food waste. It only took me 6 months of reading this blog to really start to look at my food waste (sorry Kristen, I’m a slow learner, apparently). I’m always afraid I will run out of something, but it doesn’t really matter if I do. I live within a mile of 3 grocery stores. Oy, me. I agree with the previous poster (actually, all of the preceeding posters) I would add that I usually offer popcorn to the kids instead of chips (which I only buy on sale, and rarely.) I have a popcorn popper and use a little canola oil (less than called for) to make homemade popcorn – drastically cheaper, no chemicals and high fiber to boot. My family really enjoys it. Served with a glass of milk (soda and juice – bah!) it makes a filling, wholesome snack. LOL! When I was growing up, air popped popcorn sprinkled with parm and a glass of milk was a meal when my dad was left in charge of feeding the kids. We do popcorn with chopped apples, small cubes of real cheddar, a little salt, cayenne pepper, and nutritional yeast (not spendy if bought in bulk) for dinner on Sundays. My husband grew up with the tradition, and I’ll admit, I’ve become a fan! The cheese can be pricey, so we cut the pieces nice and small to get bang for our buck. We’ve discovered that even a water filter can’t fix iron heavy water so buying water is unfortunately a necessity for us. I’m also convinced that people eat oatmeal because they think they should. I’ve never actually heard anyone say that oatmeal tastes too. It’s library paste to my palate. I also think a good thing to point out is to save on convenience items. The prime example is baby carrots. Seriously, how long does it take to wash and/or peel a carrot and then cut it. 1 minute? Yet we pay almost double for a factory to do it for us. I do bake my own bread but this is more because I want to over saving money. Bread Flour isn’t exactly free. I like oatmeal. I prefer it made with milk, a little thicker than container recipe, with a pinch of salt OR chopped fruit. My roommate eats it with made with water, somewhat thinner than container recipe, and topped with a lot of brown sugar. You can also treat it like polenta: make it, chill it, fry it up like pancakes. When you make it like polenta, do you use the container recipe or make it thicker or thinner? I’m with William B. Cream of wheat or cream of rice too. Using 1 or 3 min oatmeal (never instant! ), I find the container recipe gets plenty stiff when it chills in the fridge. I like oatmeal too! I eat it with chopped apples and maple syrup in the winter. In the summer here it’s just too hot to enjoy it. Since you’re asking – I get steel-cut oats in bulk, and usually make it overnight (SO EASY!) once a week, then warm it up in the morning. With milk and toasted nuts, or sometimes berries, and yes, I’ll admit it, a bit of sugar, it’s really tasty. Not pasty at all. If you’re used to conventional cereal, don’t be shy about adding sugar to taste. I think oatmeal tastes like paste also. I’ve seen/read if you “doctor” it up, it tastes better, but by the time I would buy that stuff, am I saving money or is it as good for you? I like to eat hummus/whole wheat bread for breakfast. But I am sure some people would turn their nose up at that, too. I’ve never enjoyed the texture of cooked oatmeal either. In Europe they eat muesli, which is basically raw oatmeal doctored up with nuts, fruit, chocolate, etc. Now I eat raw oatmeal with a few almonds sprinkled on top with some honey and milk and love it. Sure the honey and almonds make it a bit more expensive, but it’s super healthy and a much better deal than normal packaged cereals. Plus you save time and energy by not using the stove. Try using old fashioned oats. I am pretty picky but I sprinkle nuts or raisins, cinnamon, brown sugar and half and half. My husband packs this to eat at work as a midmorning snack, instead of half and half he puts in powdered milk. I’m happy to see that we are doing most of these things (although our food waste could use a little work). We are also gardening, and though it’s not providing anything at the moment, I’m excited to see what comes up soon! For our little family of 2 adults, we spend about $300 a month on groceries. I feel like comparatively this is a lot, but we also live in a relatively expensive area (suburbs of Seattle) and eat a LOT of fruits and veggies which are kinda expensive to buy. But we buy hardly any packaged food (other than the WW Smart Ones which are ideal for us for quick lunches) and the most we eat is lunch (we are out a few times a week around dinner). Could we go cheaper? Sure, if we needed to or wanted to, but I think our habits work for US which is what’s important! I used to spend all of Sunday cooking and freezing, but we just don’t have the freezer space (we have a seal-a-meal so we seal and freeze a lot of meats when they’re on sale). I think this will change when I have older kids, and then we’ll probably invest in a large freezer for our garage. Hey Megg – I live in the suburbs of Seattle too. I’m glad to hear someone else say they spend about $300 for two people – that’s about what I spend, and I am pretty careful with what I buy. Have you tried a Winnco if there is one near you? That is a huge savings for me over shopping at QFC or Safeway. I was just thinking the other day about when we first moved here and lived in Magnolia – there was no where cheap to shop and my grocery bill was regularly $200 a week because we only had a couple of upscale grocery stores to choose from. One good thing about living in the suburbs – more shopping options! I’m also in Seattle (almost in Shoreline, so I think we’d be considered the suburbs as well). I had no idea there was a Winco around here–I’ll have to check it out. Thanks! Thanks you for your perspective! Balance, boundaries and limits are important. I think that there are ways to lower food budgets without compromising your health. I use a home delivery organic produce service and recently started couponing. Looking for ingredients, not meals Thanks to Michael Pollan and Nina Planck, there are some food products that are just not worthy of being in my home, even if it is “free” with couponing and I look at shopping/couponing much differently. I did buy lots of cereal with all the special deals/coupons for the summer months, but that is not going to be what we eat every day. Yesterday, I made bagels for the first time. Yummy! After getting great deals on sugary sweet yoplait yogurt, I decided to go back to making my own and am looking for a crockpot recipe. One subject I haven’t seen here before is root cellaring. If you are a gardener or like to buy bulk produce in season, this is another option for storing your food, and usually without using any extra packaging (mason jars or freezer bags) or energy (stove or freezer). I just read a great book from the library–“Root Cellaring” by Mike & Nancy Bubel. Might not work for everyone’s climate or living situation, but I thought I’d throw it out there. I read your list and thought “that’s exactly how we shop!”. Its really great to see someone else having success with the same approach. We’re currently testing a $25/week grocery budget for two (just food) and it’s going really well. Love your post!!! I also feed a family of six ( 2 adults,18,15,12, and9)on $100.00 a week. I have bigger stomachs to fill, so keeping our grocery budget down has become quite a challenge. I am a huge fan of gardening. People don’t realize how much food they can really grow is a small area. Our garden area is only 300 square feet, but I grow enough to eat fresh produce most of the summer and fall, share with the neighbors, plus can and freeze extra to get up by until next years garden. I also have a baking day every week. I make bread, muffins (their always seems to be questionable fruit that needs to be used up at my house. ), cookies (for lunches), and rolls or buns for the week’s menu. I also buy pantry staples in the bulk section (less packaging) and on loss leader sales. I make every thing from scratch. Now I even make my kid’s popsicles and pudding pops (thank you Kristen for the idea). I also stretch the hamburger in sloppy joes, meatloaf, and taco meat by adding cooked brown lentils or shredded baked potato. We are big Dave Ramsey fans in our house and started using Emealz that was recommended by him. The menu plan is enough to feed my family of 4 (the baby isn’t on solids yet, so only 3 are eating) and there are leftovers for 2 to have lunch the next day. My husband doesn’t like leftovers so my son takes a serving for lunch and I eat the other. Since the meal plan has you shop for the smallest package amount required for the meal my pantry and fridge only has what will get eaten in a week. I do buy breakfast foods and some snacks but it’s mostly fresh produce. I think one of the main ways to save money generally is to limit how often you go out to eat. Kristen and everyone else here has mentioned cooking at home as a strategy and I couldn’t agree more. I taught myself how to cook from following recipes on the internet; I only tried recipes that were heavily and favorably reviewed and I found that successful results were extremely encouraging. As someone else also mentioned, I do almost all of my cooking on the weekends. I work fairly long hours during the weekdays and the last thing I feel like doing sometimes when I get home is cook a full meal. By having “prepared” foods in the fridge and freezer already, getting meals together is a cinch. I try to shop the sales! I plan my week’s menu after looking at the sale bills for that week at my grocery store. I also stock up when canned goods or dry ingredients are on sale. I love paying $.50 for a can of vegetables, rather than the $1.19 they usually cost! I use a lot of soups in casseroles and you can get great sale prices on those, too. Meats are so expensive these days, I watch for sales and grab a couple extra packages to stick in the freezer to use in the next couple of weeks. With the price of everything going up these days, you would be surprised how much you can save by taking advantage of weekly grocery sales! Rather serve hunk o’ meat, make it part of a larger dish such as casserole, stir fry, pasta sauce, etc. In many instances you can add vegetable proteins as well; the bit of meat boosts the usable protein from the legumes. Also look for dishes that use legumes rather than meat – in my experience, dishes that are designed for legumes are more easily accepted than trying to substitute for dishes that are supposed to have meat. TAuthentic Asian (rather than recipes written for the meat-loving West), Indian, and Latin American cuisines all include many low/no meat dishes. 2. Buy “seconds” from farmers markets. 3. Buy the last offerings from farmers markets. Well, I for one love the taste of oatmeal — and have it five out of seven days a week for breakfast. However, I use real oats (which we buy in bulk), and it only takes about three minutes to cook. (I usually turn the stove on low and drink my tea while it simmers, which might be 20 or more minutes. This works great if you aren’t pressed for time.) With skim milk and fresh fruit, I am a happy camper. If you have only ever eaten instant oatmeal, which indeed tastes like a gloopy paste, there is no comparison. If you have a food co-op/natural food store in your area check out the bulk bins. We buy all of our rice (white and brown basmati, jasmine, risotto), dry beans, whole grain flours, almonds, quinoa, couscous, and herbs and spices in bulk. You will save money and also packaging. And you only need to buy what you can use. An excellent choice if it is available to you. I know this sounds really cheap, but no matter how much meat I put on the table, my son would eat it. So, I just don’t cook as much meat and he’ll still get full but on the less expensive veggies, fruits, etc. He likes those as well, so I ‘m not depriving him or letting him go hungry, I’m just adding some involuntary variety to his diet. I’m trying to learn how to make my own convenience foods. I found a recipe for hamburger helper type skillet meals and I’ve tweaked it to where my kids actually prefer it over the boxed mix. The other nice thing about that is that again, I can control portion size. One recipe with a light pound of locally raised angus beef, steamed veggies that I froze last summer and either a fruit or veggie salad or home made bread and really I bet I don’t have $6 in dinner for my 2 teens and I and it’s WAY better than prepared by someone else or from a box. And there is usually at least one item leftover that can be used in the next day’s lunch. Aldi is a life saver for me! I’m actually attending a couponing class tomorrow at our church, but I’m not convinced she’ll show me how to save money, still, I’m interested in what she has to share. We also have a family of six, a grocery budget at $100 a week. This month I’ve managed to come under budget every week (it just takes diligence!) and at this point in the month my budget is reflecting a surplus of $75! At this rate, I can spend that surplus alone next week, and have $100 leftover in my budget for the month! Hooray for Aldi! I know you may have shared this before, but where do you buy your flour? (And sugar, oats, etc.) I know you must buy it in large quantities, seeing as you use so much! How do you know you’re getting the best deal on those things that you buy in “bulk”? I do generics as well. Our Family has a website where you can print off coupons for their generics. I do that quite a bit because I would still be buying that brand anyway. I am so fortunate to have spring water from my tap since we have well water,so drinking water is an easy way to save. I am so grateful that we can use an endless amount of water without a bill from the city! I’ve been focusing on not wasting food and cooking more. I’m also working on not over-buying since it’s just me. I eat the same meal sometimes for a few days then freeze the rest. I discovered greek yogurt as a good protein but it’s so expensive – Kroger has carbmaster that is good protein and low carb and it’s 38 cts now so i asked a coworker to pick some up for me since it’s convenient to where she lives/shops and it’s not for me. I also buy store brand and wal-mart is my main stockup place – I don’t keep a huge reserve since I tend to ‘lose’ stuff in the small pantry and freezer/fridge but I like to have 3-6 cans of some things. I have enough pasta for a while when kroger had the 38 ct sale a few weeks ago and enough bbq sauce until there’s a good sale(have a few coupons to use but that size wasn’t on sale). I focus mainly on 2 grocery store ads each week – Randalls which is right near my house and is expensive though some sale items are good deals(wish I’d waited on the 18 ct eggs they had for $2 since Kroger has them 1.77 this week..sigh..). They’re convenient and have some decent sales sometimes. The other is Food Town – this is near the library branch I go to most and is pretty cheap on certain things – esp their sale items. They often have chicken breasts and chicken legs on sale as well as hispanic type food items like certain brands of refried beans, tortillas, canned tomatoes and produce that’s been decent. The 3rd ad I’ll look over is Kroger since coworker is willing to pick up some stuff for me when she goes and if there’s a lot and my day off falls on a weight watchers meeting day I can go by after the meeting and it not be too much out of the way t hough it’s harder with summer nearly here since I can’t make any more stops if anything is perishable. Have you ever tried beer bread? I’ve made a whole wheat honey recipe before & it’s super easy (and since beer is used, you don’t have to mess with yeast). Just a suggestion if you’re not opposed to using alcohol to bake. sounds interesting beer’s not something I have around but could get some I guess..do you remember where you found the recipe? During the summers, however, I made up a basic snack/lunch menu…I found that the kids don’t whine about wanting “treats” as much if the menu has been objectively stated ahead of time. It also eliminates the last minute “what should I make Right Now?” quandry which often ends with a package of mac & cheese or a box of Wheat Thins. I’d love to know how other parents deal with lunches, particularly what foods meet the inexpensive/nutritious/cool-enough-to-trade requirements! I pack a lot of leftovers for lunches. That seems to cover the cost and helps me with my food waste goals. I try to never buy things like laundry detergent, shampoo, deoderant, toilet paper, paper towels without a coupon & sale. Those are things I will stockpile if I find them cheap somewhere. The other thing I do is always make a list of what I need, so that a. I don’t forget anything and b. I keep on track with what I actually need, versus what I have the impulse to buy. And lastly, I never, ever shop on an empty stomach. I learned that trick from my mom. If I’m hungry I tend to buy a lot more junk than if I go on a full stomach. Planning is a big way I save on our grocery budget.. Shopping once for everything I need (except extra fruits and veggies) keeps me out of the store, so it saves money. The less time I spend at the grocery store, the less money I spend! Excellent post! I am going to have to try some of the ideas you have listed. One thing we already do is drink water. On the “eat less” side, I would also add eat less MEAT. As I recall, one of the things Kristen does is use meat more as a flavoring than a main dish. For me it is all about menu planning and making a list. Just the other day, I dropped my daughter off for quilting lessons and right next door is Trader Joe’s so, I stopped in. $100 later….. I bought stuff we eat but it definitely wasn’t on my list this week. Most of the food is frozen stuff that I normally buy for those emergency night dinners like frozen fish which is really good here and snacks like lowfat cookies, crackers, etc… However, I find if I stick with a menu and a list I do better but that isn’t always possible every week. I do cook mostly homemade dinners. The other day I even made my own homemade chocolate ice cream syrup. Came out great and only took about 5 minutes to make. 1. Plan a menu. Into that menu, plan a leftover night. I usually make LO Thursday night – I shop on Saturdays, so we’re getting to the end of our shopping week, and we always have homemade pizza on Fridays, so if there’s any leftovers remaining for Thursday’s LO night, they’re not going to get eaten for at least another day or two unless we eat them on Thursday. Also, by Thursday I’m starting to get cooking burnout, and it’s nice to have a night of just reheating a bunch of stuff. 2. Make a list and stick to it. Decide on your budget for the week ahead of time, and write down the price of each item you put in your cart. BEFORE you get anywhere near the checkout (I usually end up doing this in the dairy section, since it’s the last place I hit and it’s at the back of the store), add up the prices of everything you’ve placed in your cart. If you’re over, put things back until you hit your budget. This feels incredibly awkward the first few times, but your budget will thank you. Returning items at checkout seems to have some sort of stigma, but replacing items as you walk towards the checkout is not nearly as awkward. 3. After you have some history of food prices (this took me about 6 weeks’ worth of shopping), start estimating your grocery cost at home before you even get to the store. This will also help you determine if that “sale” is really worth it. One of the stores near me frequently does a mix-and-match “10 for $10” sale. Some of the items are drastically reduced, some are a normal price, and some are actually increased (tuna is usually $0.89/can for the small cans, and it frequently gets included in these so-called sales!). 4. EAT BEFORE YOU SHOP. I don’t care if you shop on Saturday morning or midnight on Tuesday – eat a solid meal (not just a granola bar, but a full meal) BEFORE you get to the grocery store. Shopping on an empty stomach is a sure-fire way to go over budget. the store near me is doing this 10 for $10 sale and I’ve noticed the same thing! I don’t think $1/lb for zucchini is great deal and at least 3 of the items I know are under $1 at walmart and one is cheaper at their store – tuna is one of the biggies. (This particular store is Randalls) sometimes Kroger does it too thought lately they’ve been doing mix and match 10 items and get $5 off the total – some are good deals and some aren’t. Great post! Two things that have reduced my grocery budget most significantly are buying in bulk (meaning, from the bulk bins, not the bulk stores) and using the crock pot. I can buy two pounds of oatmeal for under three dollars, and just like that I have breakfast covered for 2 or 3 weeks (we are a family of three). I also get rice, corn meal, dry beans, quinoa, whole wheat pastry flour, and dried cranberries from the bulk bins. I never buy rolls, muffins, scones, or pancake mix or anything like that because the bulk bins supply the ingredients I need to make those myself. As far as the crockpot goes, I usually get a whole chicken for under $6 at Trader Joe’s, and after I’ve cooked it in the crock pot I can get 2-3 dinners and 2-3 lunches (in the form of chicken salad sandwiches) out of the single chicken. You’re right when you say to buy ingredients instead of meals. I hardly ever use coupons, either! My two biggest ways to keep costs reasonable (I live in an extremely expensive part of the country food-wise) is to cook almost everything from scratch, and to try my hardest not to waste food (Kristen, your FWF’s have been a real inspiration!). I’ve never been an impulse food purchaser, but I realized that I would go grocery shopping on a certain day because I felt like it was time to go, not because we needed food. So I’m really trying to limit my grocery shopping trips. However I do go to the farmers’ market every week for fresh produce. Limiting my grocery trips is making a big difference in our expenditures and food waste. I do shop Aldi, but not every week. Two things I do to curb food costs are shop the perimeter of the store. This is where the healthier foods are located. There are very few middle aisles that I go down for any of our groceries. Baking supplies, paper goods, & toiletries come to mind, but those aren’t things I purchase each week. The perimeter of the store (along the outside walls) is where you’ll find the produce, deli/bakery, meat, dairy, & frozen foods. The other thing I do is plant a fairly large garden. For 4-6 months, we’ll have nearly free salad ingredients practically at our fingertips. I can green beans, pickles, tomato juice, stewed tomatoes, salsa, and jams & jellies. Last year, I gave my mom a case (12ct.) of my canned green beans (pints), and some black raspberry jelly, for Christmas. You would have thought I’d just given her a diamond ring or something. lol I also will make my own pumpkin puree to use in pumpkin pies. But I freeze that. Even if you don’t have a large space for a big garden, container gardening is easy to do, and will help save money on groceries. Also, put the word out to neighbors & family members who garden. Most of them are willing to share their bounty!! My kids and I aren’t big fans of just drinking water with meals, but we cold-brew flavored caffiene-free teas (about 5 tea bags of your choice in a gallon of water sitting on the counter overnight) and it’s pretty frugal–I try to buy the teas on sale and we get many gallons for just a few dollars. We don’t add sweeteners, many of these teas already taste sweet without any sugar. I’m not a big fan of (Costco type) bulk buying in general because we don’t have the storage space but I do buy toilet paper, soap, shampoo, toothpaste, and laundry items in bulk because you can save a lot of money there and not worry about these items “going bad”. And one thing must be bought in bulk to really save money–yeast. You can get 1 to 2 POUNDS of yeast for just a few dollars at a bulk store, the cost of individual packets and jars at the grocery store is just outrageous! I’m not a big fan of (Costco type) bulk buying in general because we don’t have the storage space but I do buy toilet paper, soap, shampoo, toothpaste, and laundry items in bulk because you can save a lot of money there and not worry about these items “going bad”. And one thing must be bought in bulk to really save money–yeast. You can get 1 to 2 POUNDS of yeast for just a few dollars at a bulk store, the cost of individual packets and jars at the grocery store is just outrageous if you are trying to save money by making your own bead. Also – unit prices. Paying attention to unit price has been a big deal around here, even though it often means shelling out more for a larger container of something up front, you’ll get more uses out of it for longer, right? Unless you won’t actually use it all, then paying more for less is a good idea if you really need it. Those ideas help a great deal. Thanks. Another thing is to get your addy on the grocery store coupon list so they can send you great deals in the mail. It is amazing how much store coupons help in these hard trying economic times. Take care. We’ve become purposefully less dependent on paper towels and we’re working toward minimal paper towel usage. We also have a rule that we don’t snack out of boredom. If anyone in the house is hungry-the snack is put on a plate and you sit at the table to eat it. I’ve found it helps us really determine if it’s about hunger or boredom. As a byproduct of this-we have a tidier house too-fewer crumbs floating around! We bake/make almost everything from scratch; breads, dressings and even our BBQ sauce. It’s cheaper, healthier but it also allows us to save on the organic store made equivalent by using organic ingredients (ketchup, mustard, vinegar, brown sugar etc) to make it that have other uses too vs. a $8 bottle of organic BBQ sauce we won’t use all that often. We’ve got a bit of a garden going and are enjoying the fruits of that. We do use coupons for some of the things we use like organic cheeses, coconut milk, breads and cereals when they’re available and on sale. Hi! Could you post the recipe for organic BBQ sauce if that is allowable? I love this post and the one about the Extreme Couponing. I’ve tried couponing (not in an extreme way though) and I just cannot maintain it on a regular basis. Plus, I am a generic shopper and most of the time the generic wins out on price and is equal or better in taste. For some reason I kept having the feeling that I must not be doing it right if the generic was coming out to be the best deal. I’m glad to know that buying generic for most things is actually as good of strategy as couponing. I guess I just needed someone to confirm it. Thanks! You do not know me but I stumbled upon your blog awhile back and find it very informative and resourseful. I really liked your thoughts on saving money without couponing! Thanks for your posting regarding saving money without using coupons. I use coupons if I have them and the item is cheaper than the store brand. I would rather spend time with my son than clipping coupons, organizing them and shopping. In my area in Oregon very few grocery stores double coupons so it does not really make it worth using coupons. All we have in the way of grocery stores are Wal Mart, Safeway, Fred Meyer’s, Grocery Outlet and Cash & Carry. The last 2 do not accept coupons. I live in a small home and not able to use the space I have to store all the items the extreme couponers buy. I cook from scratch for most meals and with my child eating mostly veggies the extreme couponing does not always cover fresh meat and veggies and fruit. So thanks again for reassuring me that I’m not the only one not using coupons to the extreme. Hi Kristen, thank you for this post, it is more than helpful. We still use a lot of coupons in this household, but your comments are spot on and helpful. I can really testify to the fact that buying non name brand, but instead store brand can really save. I haven’t found there to be any difference really between store bought brands and name brands that cost more. In your experience, have you seen any differences in such products? I still believe that coupons are valuable and can extend the savings even further than how you demonstrated in this writing…great article and again, thank you for helping us all! I was so happy to find this post. I have never understood couponing. The huge amounts of stuff , maybe for free or close to but I don’t need 20 of something and stuff I don’t use. I have always thought I did well with purchasing store brands and stuff on sale. Thank you!! Love these ideas! Husband has always tried to make me a coupon queen, and now I have you on my side!! LOL.. I tried coupons for a while, but we ended up donating most of the food. Even though it was dirt cheap, we didn’t want to eat hamburger helper and other processed foods. We are used to eating homemade food and my kids even complained about the processed food. I stick to a $50 per week grocery budget now and we eat healthy foods. I don’t miss the coupon cutting or going from store to store or all the hassles at the check out stand. Now it takes less time to shop, we eat healthier and I spend the same amount as I used to. Great post! I love ALDI for baking supplies, dairy, and certain canned goods. I envy those who say they can shop for $50-100 a week… I do not think that is possible where I live! We eat a lot of fresh produce, and even though I garden, shop at a farmer’s market, and join a CSA every summer, I just cannot get the bill down below $150/week. That does include non-food items, though. However I know I spend far less than some families in my area, who regularly have $300 weekly food bill. I know one woman who spends nearly $400! Your location has a lot to do with it, so I think it’s important to take that into consideration. I am always looking for more ways to save. I used to do the whole couponing game thing, and while I did save on some things, it was just too time-consuming, and often didn’t fit how we eat. When ALDI opened nearby, I quit the coupons altogether, because I save so much by getting certain items there. We are a family of six. Two adults and four children just curious to see ideas to help save. I am a stay at home mother and my fiance’ works so needless to say we are making it but there is always a way to save more just as a nmother wonderin if any of the readers here have any ideas that I haven’t already tried or could try thank. I save money by price matching my groceries at WalMart. They will price match any advertised price from any local or national store as long as that store is located nearby. I typically save $15-$25 a week with only using a few coupons. And I stock up on items when they are on sale. Most coupons are for processed food anyway. So I only use coupons for beauty or cleaning products.